For the warships, see HMAS Toowoomba. For the region, see Toowoomba Region. Toowoomba (nicknamed 'The Garden City') is a regional city in the Darling Downs region in the Australian state of Queensland. 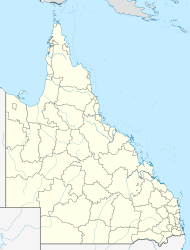 It is 125 km (78 mi) west of Queensland's capital city Brisbane by road. The estimated urban population of Toowoomba as of June 2017 was 135,631. A university and cathedral city, it hosts the Toowoomba Carnival of Flowers each September and national championship events for the sports of mountain biking and motocross. There are more than 150 public parks and gardens in Toowoomba. It has developed into a regional centre for business and government services. It is also referred to as the capital of the Darling Downs. Toowoomba is served by Toowoomba Wellcamp Airport and the smaller Toowoomba City Aerodrome. Main Street of Toowoomba in 1897. Giabal and Jarowair are recognised as the two main Aboriginal language groups of the Toowoomba with Giabal extending south of the city while Jarowair extends north of the city. This traditional landscape changed dramatically with the settlement of Drayton in the 1840s and the pastoral expansion west. Those Aboriginal Australians that survived the frontier conflict of this time were pushed to the fringe of society in camps and later moved to missions such as Deebing Creek, Durundur and later Barambah (now Cherbourg). There is evidence that local Aboriginal Australians were working on the properties to the west of Toowoomba in this contact period. Ceremonies such as the Bonye Bonye festival remained active until the late 19th century – groups from south east and south west Queensland as well as northern New South Wales gathered at Gummingurru, near Gowrie (west of Toowoomba) prior to attending the festival. The Gummingurru site is being restored and remains an important ceremonial place for not only the traditional groups but neighbouring groups. Toowoomba's colonial history traces back to 1816 when English botanist and explorer Allan Cunningham arrived in Australia from Brazil and in June 1827 discovered 4 million acres (16,000 km2) of rich farming and grazing land, which became known as the Darling Downs, bordered on the east by the Great Dividing Range and 160 kilometres (99 mi) west of the settlement of Moreton Bay. Thirteen years later when George and Patrick Leslie established Toolburra Station 56 miles (90 km) south-west of Toowoomba the first settlers arrived on the Downs and established a township of bark-slab shops called The Springs which was soon renamed Drayton. Land for the town was first surveyed in 1849, then again in 1853. Towards the end of the 1840s Drayton had grown to the point where it had its own newspaper, general store, trading post and the Royal Bull's Head Inn, which was built by William Horton and still stands today. Horton is regarded as the true founder of Toowoomba, despite the fact that he was not the first man to live there. Drovers and wagon masters spread the news of the new settlement at Toowoomba. By 1858 Toowoomba was growing fast. It had a population of 700, three hotels and many stores. Land selling at £4 per acre (£10 per hectare) in 1850 was by then £150 per acre (£370 per hectare). Governor Bowen granted the wish of locals and a new municipality was proclaimed on 24 November 1860. The first town council election took place on 4 January 1861 and William Henry Groom won. The railway from Ipswich was opened in 1867, bringing with it business development. In 1892, the Under Secretary of Public Land proclaimed Toowoomba and the surrounding areas as a township and in 1904 Toowoomba was declared a city. Pastoralism replaced agriculture and dairying by the 1900s. Toowoomba was named as Australia's Tidiest Town in 2008. The rich volcanic soil in the region helps maintain the 150 public parks that are scattered across the city. Jacaranda, camphor laurel and plane trees line many of the city streets. The city's reputation as 'The Garden City' is highlighted during the Australian Carnival of Flowers festival held in September each year. Deciduous trees from around the world line many of the parks, giving a display of autumn colour. Toowoomba has a warm humid subtropical climate (Cfa) with warm summers and cool winters. Compared to other parts of Queensland, Toowoomba experiences more frequent high winds, hail and fog and is considered cooler than many other towns and cities in Queensland, having more similarities with the climate of Sydney in southern New South Wales. The city is rather sunny, receiving 107.2 clear days annually. Daily maximum temperatures in Toowoomba average 28 °C (82 °F) in summer and 17 °C (63 °F) in winter. Unlike most of inland Queensland, summer temperatures above 35 °C (95 °F) are uncommon, whilst winter days rarely warm above 20 °C (68 °F). Winter nights seldom drop below freezing; however, in a situation unique among Queensland cities, snow has been reported on the higher parts of the city on several occasions. Light frost will be experienced several nights each winter in the city centre, more often in the western suburbs. According to the Bureau of Meteorology, the highest temperature ever recorded in Toowoomba was 40.8 °C (105.4 °F) on 12 February 2017, while the lowest was −4.4 °C (24.1 °F) on 12 July 1965. Average annual rainfall, according to the Bureau of Meteorology, is 724 mm (28.5 in), which peaks in the warm season. Rainfall in the eastern suburbs along the Great Dividing Range nudges 1,000 mm (39 in) per year. The majority of Toowoombas rain falls from November to March, with January and February being the peak rainy months. Like most of south-east Queensland, severe thunderstorms can be a threat and Toowoomba may occasionally be affected by ex-tropical cyclones. On 10 January 2011, Toowoomba suffered a catastrophic flash flood. Unusually heavy rainfall had occurred in the preceding days, causing the city's waterways to become swollen. Around midday, an intense storm moved in from the northeast, completely overwhelming East Creek and West Creek which run through the CBD. 149.6 mm (5.89 in) fell in one day with rainfall peaking at 144 mm/h (5.7 in/h) over one 10-minute interval. The flood caused damage to properties and infrastructure, and resulted in the deaths of 2 people in Toowoomba. Toowoomba's history has been preserved in its buildings. Examples of architecture drawing from the city's wealthy beginnings include Toowoomba City Hall which was Queensland's first purpose-built town hall, the National Trust Royal Bull's Head Inn and many examples in the heritage-listed Russell Street. Immediately to the east of the CBD is the Caledonian Estate, an area of turn-of-the-20th-century housing, ranging from humble workers cottages to large stately homes, in the classic wooden Queenslander style. Toowoomba is also home to the Empire Theatre, which was originally opened in June 1911, as a silent movie house. In February 1933, fire broke out, almost completely destroying the building. However, the Empire was rebuilt and reopened in November 1933. The architectural styling of the new Empire Theatre was art deco, in keeping with the trend of the 1930s. After years of neglect, the Empire Theatre was extensively renovated in the late 1990s, but retains much of its art deco architecture and decorations, especially the proscenium arch. Able to seat approximately 1,500 people, the Empire Theatre is now the largest regional theatre in Australia. The city also is home to the Cobb & Co Museum, hailing to the famous mail company's beginnings as a small mail run in the 1800s to transport mail and passengers to Brisbane and beyond. It also houses Australia's largest collection of horse-drawn vehicles. The museum has undergone a A$8 million redevelopment before reopening in September 2010. Toowoomba is the seat of the Toowoomba Region local government area. The city is represented in the Parliament of Queensland by three seats: Toowoomba North, Toowoomba South and Condamine. In the Commonwealth Parliament, Toowoomba forms part of the Division of Groom, which is held by John McVeigh for the Liberal National Party of Queensland. The current Mayor of Toowoomba is Mayor Paul Antonio. The Australian Defence Force is also present in the local community, with the city providing housing and amenities for many of the personnel based at the Oakey Army Aviation Centre (in Oakey, 29 km (18 mi) NW of Toowoomba) and Borneo Barracks at Cabarlah to the city's North. The headquarters of Heritage Bank, which is Australia's largest mutual bank, FK Gardners and Wagners are located in Toowoomba. Economic growth potential in the region has been identified through retail, construction and the development of energy resources found in the Surat Basin and in food processing. As well as the development of the newly built Wellcamp Airport, the under construction, Second Range Crossing and proposed Inland Rail the city is set to become one the largest logistical centres in the country as well as a major inland port. Toowoomba is a major education centre. Drayton State School is the oldest school in Toowoomba. Toowoomba South State School is the oldest school in Toowoomba proper. Christian Outreach College Christian co-educational school. Fairholme College a Presbyterian Church of Queensland school. Toowoomba Grammar School, independent grammar school (est.1875). TAFE Queensland South West (Formerly SQIT) has extensive campuses to the east of the CBD. University of Queensland has a small centre in Toowoomba. Griffith University has a small health training facility in Toowoomba. Toowoomba is nationally renowned for the annual Carnival of Flowers, held each year in September. Many of the city's major parks and gardens are especially prepared for the carnival, including an important home garden competition and parade of flower floats. Buses bring people from around the nation, and a popular way to arrive at the carnival from Brisbane is on chartered antique steam and diesel trains, which captures the yester-year aspect of travel to Toowoomba with 19th-century wooden carriages. In 1953 the Carnival of Flowers was the subject of a sponsored film produced by the Queensland Minister for Lands and Irrigation. The Carnival of Flowers depicts the floral parade, the home gardens competition and the crowning of the Floral Queen and is a wonderful portrait of life in 1950s Queensland. In 2009 as part of the Q150 celebrations, Carnival of Flowers was announced as one of the Q150 Icons of Queensland for its role as an "Events and festivals". Toowoomba also hosts 'First Coat Art and Music Festival'. First Coat is a street art festival, held annually in May. As a result of the festival, over 50 pieces of large-scale, public art exist throughout the Toowoomba CBD, which has led to a transformation of previously underutilised lane and alleyways, as well as a reduction in costs associated with graffiti management. Toowoomba was previously home to Easterfest (which was held annually over the Easter weekend.) The event has not continued after 2015. Toowoomba also is home to the Weis Bar and possibly the Lamington. The urban laneway cafe trend of Melbourne, is also growing increasing popular in the city with the opening of laneway cafes such as GroundUp Espresso and Bunker Records. Rugby league is a popular sport in Toowoomba. A team representing Toowoomba used to compete in the Bulimba Cup tournament. Toowoomba currently does not host a team in any of the major national competitions but was home to the Toowoomba Clydesdales in the Queensland Cup state league. The Clydesdales were the feeder team for Brisbane Broncos in the National Rugby League (NRL) from 1999 to 2006. The Clysedales dropped out of the Queensland Cup after the 2006 season due to financial difficulties and are no longer a feeder club for the Brisbane Broncos. In 2018 a game will be held between the Gold Coast Titans and the St George Illawarra Dragons on Sunday, 25 March at the Toowoomba Sports Ground. Towoomba features a semi-professional football club, South West Queensland Thunder, that has a large following within the community. Australian rules football is played by four senior teams in the AFL Darling Downs competition: Coolaroo, Toowoomba Tigers, University of Southern Queensland and South Toowoomba. The sport has gained popularity amongst juniors with eleven clubs in the region. The four Senior Toowoomba clubs compete with five other clubs in towns such as Dalby, Gatton, Goondiwindi, Highfields and Warwick. In 2006, Brad Howard became the first draftee from Toowoomba to the Australian Football League. Toowoomba has clubs for other sports including cricket (Toowoomba Cricket Inc), archery, swimming, tennis, softball, baseball, netball (Toowoomba Netball Association), hockey (Toowoomba Hockey Association), gridiron (Chargers) and basketball (Toowoomba Basketball Association). The city is also home to the Toowoomba Mountaineers basketball team, which participates in the Queensland Basketball League (QBL). Toowoomba also shares two prestigious golf courses; Toowoomba Golf Club Middle Ridge, and City Golf Club Toowoomba. These two clubs, as well as several other clubs in the district, conduct an annual Pennant season. Each club take on each other in Match play and in several different divisions to be crowned the Pennant winners of the Year. City Golf Club also hosted the Queensland PGA Championship from 2009 to 2013. Sport at both junior and senior level in Toowoomba and surrounding areas is promoted by Sports Darling Downs, a non-profit organisation based in Toowoomba. Toowoomba is home to Clifford Park Racecourse. Clifford Park Racecourse was acquired as a 160-acre (0.65 km2) block in 1861. The Toowoomba Turf Club was formed in 1882 and the first recorded Toowoomba Cup was run in 1919. In 1992, the club made Australian racing history by staging the first race ever run under electric lights: the Fosters Toowoomba Cup, which was won by Waigani Drive. In 1996 the club staged the first night race meeting in Australia. Toowoomba has a number of rugby union teams, including University of Southern Queensland Rugby Union Club, Toowoomba Rangers Rugby Union Club, Toowoomba City Rugby Club, which compete in the Darling Downs Rugby Union competition, against such teams as the Roma Echidnas, the Condamine Cods, the Dalby Wheatmen, the Goondiwindi Emus, the Warwick Water Rats and the University of Queensland Rugby Union Club (Gatton Campus). Cycling is a popular sport in Toowoomba. The Tour of Toowoomba in 2010 became a round of the Subaru National Road Series and attracted 15 teams. A proposal to stage a National Road Series event in Toowoomba was first presented to the Toowoomba Cycling Club in late 2009 by John Osborne OAM, a lifelong cycling enthusiast. The inaugural FKG Tour of Toowoomba was won by Patrick Shaw riding for the Virgin Blue RBS Morgan team. Patrick was later named Cycling Australia's Road Cyclist of the Year – 2010. The Toowoomba branch of the Queensland Country Women's Association meets at 263 Margaret Street and the Toowoomba City Business Women’s branch meets at 161 Margaret Street. Toowoomba is serviced by three commercial national network stations and two national non-commercial network stations. These are Seven Queensland, Nine, WIN Television, ABC TV (ABC1) and SBS TV (SBS ONE). Each broadcasts television services in digital format, with analogue transmissions having been deactivated on 6 December 2011. Of the three main commercial networks, Seven Queensland and WIN Television broadcast half-hour local news bulletins at 6pm each weeknight, both produced from local newsrooms but broadcast from studios in Maroochydore. Southern Cross Austereo has offices in the city with short local news updates airing on Channel 9 throughout the day, presented from studios in Canberra. Brisbane metropolitan commercial channels BTQ-7 (Seven Network), QTQ-9 (Nine Network) and TVQ-10 (Network Ten) broadcasting from transmission towers at Mount Coot-tha can also be received in some parts of Toowoomba. There is a suburban bus service operated by Bus Queensland Toowoomba throughout the city. This is a TransLink service. Stonestreets Coaches operate many school services in the city. There are frequent inter-city bus services between Toowoomba and Brisbane, and other centres operated by Greyhound Australia and Murrays. Toowoomba was the headquarters for McCafferty's Coaches that operated a national long distance coach network until its sale to Greyhound Australia in 2004. Toowoomba station has a twice-weekly rail service from Brisbane to Charleville and return on Queensland Rail's The Westlander. Toowoomba is criss-crossed by several railway lines that are largely unused, or used for freight, and idle railway stations can be found in the suburbs (including Ballard, Drayton, Harlaxton and Harristown), dating to when these localities were separate centres. Toowoomba is served by Toowoomba Wellcamp Airport, which is serviced by QantasLink, Airnorth and Regional Express Airlines, with flights to Sydney, Melbourne, Cairns and Townsville and destinations west of the city, but there is potential for services to Mackay and overseas. Toowoomba City Aerodrome is located in Toowoomba's outer suburbs. The city's former airport is now primarily used by the Royal Flying Doctor Service, LifeFlight and the Darling Downs Aero Club. 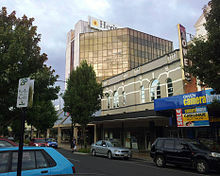 Toowoomba is serviced by four hospitals: Toowoomba Base Hospital, which is a public hospital and one of the largest hospitals in regional Australia; a specialist psychiatric hospital called Baillie Henderson Hospital; and two private hospitals: St. Andrew's Toowoomba Hospital and St. Vincents Hospital. There is also the Toowoomba Hospice which is a community-based private healthcare facility which provides palliative care to the terminally ill.
Toowoomba's third water storage Cressbrook Dam was completed in 1983 and supplied water to Toowoomba in 1988. It has a full capacity of about 80,000 megalitres (2.8 billion cubic feet) bringing total capacity of the three dams, Cooby, Perseverance, and Cressbrook, to 126,000 megalitres (4.4 billion cubic feet). The city also has underground supplies in fractured basalt of the rock unit known as the Main Range Volcanics. Toowoomba also sits above the eastern edge of the Great Artesian Basin and to the west underground water is available beneath unconsolidated alluvium. Rainfall during the period from 1998 to 2005 was 30% below the long term average, consistent with a prolonged drought; with this trend continuing through to the spring of 2007. In mid-2005, the water situation for the city was becoming critical with water supply levels below 30%. Environmental flows from Cressbrook Dam into Cressbrook Creek were allowed to cease as Toowoomba approached level five water restrictions. During March 2006 the surface water storage in the dams fell below 25% of full capacity, falling further to 12.8% on 10 March 2008 and reaching an all-time low of 7.7% in December 2009. The former Toowoomba Mayor Di Thorley proposed a controversial potable reuse project under the Toowoomba Water Futures plan which would result in water reclaimed from the Wetalla Sewage Treatment Plant being returned to Cooby Dam to provide 25% of the potable water supply for Toowoomba. Other water supply options include importing water from Oakey Creek Groundwater Management Area (average TDS 1660 mg/L), importing water from Condamine Groundwater Management Area (average TDS 740 mg/L), and water from coal seam gas production (TDS 1200–4300 mg/L). 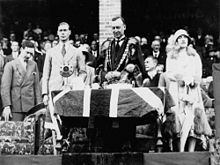 Their Royal Highnesses, The Duke and Duchess of York, with Mayor James Douglas Annand in Toowoomba, 1927. On 29 July 2006, Toowoomba City Council conducted a poll of Toowoomba residents on the proposal to use this multi-barrier filtration system for filtering sewage for drinking purposes. The poll question was: "Do you support the addition of purified recycled water to Toowoomba's water supply via Cooby Dam as proposed by Water Futures – Toowoomba?" 38% of voters supported the proposal and 62% opposed. This meant that despite dams reaching critical levels, the city rejected the use of recycled water in a plebiscite. Since the public rejection in 2006 of adding recycled sewage to the drinking water supply, water conservation measures have included harvesting stormwater for use in public parks and adding filtered groundwater to the town water supply. The city was under level 5 water restrictions as of 26 September 2006. This prohibits residents from using town water on their lawns, gardens or cars, and residents are strongly urged to cut down on water consumption. In 2007, the Toowoomba City Council commenced a bore drilling program to augment the dwindling dam supplies and constructed several subartesian bores across the city and one artesian bore at Wetalla in the city's north. Many of the subartesian bores provided potable water with a reliable yield and have been developed into production however the artesian bore's water quality was very poor, prohibiting development as a potable source. This was an expensive setback for the city as the cost was over A$2 million for drilling to over 700 m (2,300 ft). In January 2008, yield testing had been stalled due to the unavailability of appropriate pumping equipment. The Toowoomba Regional Council began supplementing the city's water supply with bore water from the Great Artesian Basin in September 2009. Groundwater has become a significant contributor to the city's water supply needs and now constitutes one third of the total volume of water treated for reticulated supply (160 megalitres (5,700,000 cu ft) per week). The state government has built a $187 million pipeline from Wivenhoe Dam to Toowoomba. Water pumping along the 38 km (24 mi) pipeline to Cressbrook Dam began in January 2010. Age distribution: Residents had a similar distribution of ages to the country overall. The median age was 36 years, compared to the national median of 37 years. Children aged under 15 years made up 20.5% of the population (national average is 19.3%) and people aged 65 years and over made up 16.1% of the population (national average is 14.0%). Ethnic diversity : 82.8% were born in Australia, compared to the national average of 70%; the next most common countries of birth were England 2.0%, New Zealand 1.5%, South Africa 0.6%, India 0.6% and Philippines 0.5%. At home, 89.2% of residents only spoke English; the next most common languages spoken at home were Arabic 0.7%, Mandarin 0.5%, Dinka 0.3%, Afrikaans 0.3% and Cantonese 0.2%. Finances: The median household weekly income was $1,021, compared to the national median of $1,234. This difference is also reflected in real estate, with the median mortgage payment being $1,517 per month, compared to the national median of $1,800. Housing: The majority (78.7%) of occupied private dwellings were separate houses, 14.0% were flats, units or apartments; and 5.8% were semi-detached (row or terrace houses, townhouses etc.). The average household size was 1.6 people. Transport: On the day of the Census, 0.8% of employed people travelled to work on public transport, and 76.1% by car (either as driver or as passenger). Toowoomba has sister city relations with three international cities: Wanganui, New Zealand; Takatsuki, Japan; and Paju, South Korea. The 2011 Australian census recorded the following statistics for religious affiliation in Toowoomba: Roman Catholic 24.7%; Anglican 22%; Uniting Church 6.8%; Lutheran 5.8%; Presbyterian 4.2%; Other Christian 4.2%; Pentecostal 1.9%; Baptist 1.6%; Church of Christ 1.1%; Buddhism 0.7%. Harrison (2006) has noted the appeal of Toowoomba as 'fertile ground' for fundamentalist Christian movements, particularly those with a religio-political outlook. This was exemplified by the Logos Foundation under the leadership of Howard Carter in the 1980s. During World War II, Toowoomba was the location of RAAF No.7 Inland Aircraft Fuel Depot (IAFD), completed in 1942 and closed on 29 August 1944. Usually consisting of 4 tanks, 31 fuel depots were built across Australia for the storage and supply of aircraft fuel for the RAAF and the US Army Air Forces at a total cost of £900,000 ($1,800,000). ^ a b "3218.0 – Regional Population Growth, Australia, 2016–17". Australian Bureau of Statistics. 24 April 2018. Archived from the original on 26 April 2018. Retrieved 26 April 2018. ^ a b c d "Toowoomba". Climate statistics for Australian locations. Bureau of Meteorology. Retrieved 22 March 2013. ^ "2011 Census Community Profiles: Toowoomba". ABS Census. Australian Bureau of Statistics. Archived from the original on 6 March 2018. Retrieved 15 September 2016. ^ "Google Maps". web page. Google. 28 April 2015. Retrieved 28 April 2015. ^ a b c d e Environmental Protection Agency (Queensland) (2000). Heritage Trails of the Great South East. State of Queensland. pp. 74–76. ISBN 0-7345-1008-X. ^ "3218.0 – Regional Population Growth, Australia, 2011–12". Australian Bureau of Statistics. 30 April 2013. Archived from the original on 5 May 2013. Retrieved 2 May 2013. ^ "Fast growing towns: Toowomba". realestate.com.au. 12 February 2015. Archived from the original on 7 January 2018. Retrieved 7 January 2018. ^ a b "Language Resources for Toowoomba and Darling Downs". State Library of Queensland. Archived from the original on 16 August 2018. Retrieved 16 August 2018. ^ "Dictionary of Australian Biography Cl-Cu". Dictionary of Australian Biography. Project Gutenberg Australia. Archived from the original on 26 July 2015. ^ "History of the region". Toowoomba Regional Council. 14 May 2008. Archived from the original on 8 March 2011. Retrieved 21 September 2010. ^ "Toowoomba – Australia's Tidiest Town 2007". Toowoomba Regional Council. Archived from the original on 16 August 2008. Retrieved 24 September 2010. ^ "Designing for Queensland's climate" (PDF). Queensland Government. pp. 3, 35. Archived (PDF) from the original on 23 December 2015. Retrieved 1 February 2016. ^ "Queensland Past and Present: 100 Years of Statistics, 1896–1996: Chapter 2, Climate and Environment" (PDF). Queensland Government. p. 31. Archived (PDF) from the original on 4 March 2016. Retrieved 1 February 2016. ^ a b c d "Climate statistics for Australian locations: Toowoomba Airport". Bureau of Meteorology. Archived from the original on 18 September 2017. Retrieved 18 September 2017. ^ "Climate statistics for Toowoomba". Bureau of Meteorology. ^ a b c "Findings of Inquest" (PDF). Office Of The State Coroner. 5 June 2012. Archived (PDF) from the original on 9 August 2014. Retrieved 3 August 2014. ^ "Daily rainfall - Middle Ridge". BOM Daily Rainfall. Australian Bureau of Meteorology. 2011. Retrieved 21 January 2019. ^ "Peter Snow & Co - Real Estate in East Toowoomba | Rangeville | Kearneys Spring | Middle Ridge". Petersnow.com.au. Archived from the original on 4 July 2014. Retrieved 4 June 2014. ^ a b "Empire Theatre marks 95th anniversary". ABC News Online. Australian Broadcasting Corporation. 28 June 2006. Archived from the original on 6 January 2008. Retrieved 24 September 2010. ^ Peter Hackney (4 September 2010). "Cobb & Co Museum reopens". The Toowoomba Chronicle. APN News & Media. Archived from the original on 6 July 2011. Retrieved 24 September 2010. ^ "Get in touch". Heritage Bank. Archived from the original on 24 January 2014. Retrieved 23 January 2014. ^ "Contact Us". FK Gardner & Sons Group. Archived from the original on 26 January 2014. Retrieved 23 January 2014. ^ "About Council: Economic development". Toowoomba Regional Council. Archived from the original on 9 December 2010. Retrieved 24 September 2010. 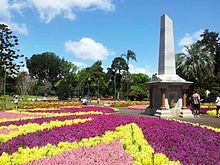 ^ "Toowoomba Carnival of Flowers – Events". about-australia.com.au. n.d. Archived from the original on 3 October 2008. Retrieved 13 October 2008. ^ "Train buffs have chance to go loco – Family Fun – Finda". EZI Drive Coaches and Mini Buses. 2007. Archived from the original on 4 May 2009. Retrieved 13 October 2008. ^ Toowoomba Chronicle (17 September 2008). "Train buffs have chance to go loco". Archived from the original on 4 May 2009. Retrieved 13 October 2008. ^ "National Film and Sound Archive: 'Carnival of Flowers' on australianscreen online". Aso.gov.au. Archived from the original on 12 March 2016. Retrieved 17 February 2016. ^ "History - TCOF". Toowoomba Carnival of Flowers. Toowoomba Regional Council. Archived from the original on 14 September 2018. Retrieved 13 September 2018. ^ "First Coat — Home". www.firstcoat.com.au. Archived from the original on 13 May 2017. ^ "Easterfest cancelled, organisers announce end of an era". Chronicle. Archived from the original on 24 October 2015. Retrieved 19 October 2015. ^ Glen McCullough (3 November 2012). "City Golf Club hoping to confirm PGA Championship return". Toowoomba Chronicle. Thechronicle.com.au. Archived from the original on 15 September 2014. Retrieved 4 June 2014. ^ "Coca-Cola QLD PGA Championship - PGA of Australia". Pga.org.au. Archived from the original on 1 November 2013. Retrieved 4 June 2014. ^ Club History[permanent dead link]. Toowoomba Turf Club. Retrieved 3 August 2014. ^ "Background | FKG Tour of Toowoomba". Touroftoowoomba.com.au. 21 November 2013. Archived from the original on 24 May 2014. Retrieved 4 June 2014. ^ a b c d About us Archived 14 February 2014 at the Wayback Machine. Toowoomba Chronicle. Toowoomba Newspapers. Retrieved 4 June 2014. ^ Toowoomba Telegraph Archived 29 October 2013 at the Wayback Machine. jf media. Retrieved 3 August 2014. ^ 31 July 2013 Updated: 2:40 PM (31 July 2013). "Staff out of work as Toowoomba Telegraph closes | Toowoomba Chronicle". Thechronicle.com.au. Archived from the original on 25 February 2014. Retrieved 4 June 2014. ^ "Network-Maps". Greyhound.com.au. Archived from the original on 25 June 2014. Retrieved 4 June 2014. ^ Westlander timetable Archived 22 March 2015 at the Wayback Machine. Queensland Rail. Retrieved 3 August 2014. ^ "Council officially renames Toowoomba's aerodrome". Archived from the original on 7 November 2017. Retrieved 6 March 2018. ^ "Cressbrook Dam". Toowoombarc.qld.gov.au. Archived from the original on 29 October 2013. Retrieved 4 June 2014. ^ "Perseverance Dam". Toowoombarc.qld.gov.au. Archived from the original on 19 September 2014. Retrieved 4 June 2014. ^ "Cooby Dam". Toowoombarc.qld.gov.au. Archived from the original on 9 April 2014. Retrieved 4 June 2014. ^ "Toowoomba bore water". Toowoombarc.qld.gov.au. Archived from the original on 19 September 2014. Retrieved 4 June 2014. ^ a b "Govt urged to review water agreement". ABC News Online. Australian Broadcasting Corporation. 25 August 2005. Retrieved 23 September 2010. ^ Anthea Gleeson (22 September 2010). "Expert not ready to 'call' drought". Warwick Daily News. APN News & Media. Archived from the original on 6 July 2011. Retrieved 23 September 2010. ^ Water Future Archived 4 March 2016 at the Wayback Machine. Toowoomba City Council. Retrieved 3 August 2014. ^ "Toowoomba says no to recycled water - National". smh.com.au. Archived from the original on 5 December 2013. Retrieved 4 June 2014. ^ Comments (13) 13 August 2011 2:00 AM (13 August 2011). "Recycled water poll: five years on | Toowoomba Chronicle". Thechronicle.com.au. Archived from the original on 6 June 2014. Retrieved 4 June 2014. ^ Mitch Gaynor (20 September 2009). "Toowoomba taps into bore water as drought continues". The Sunday Mail. Queensland Newspapers. Archived from the original on 9 June 2012. Retrieved 23 September 2010. ^ "Weekly Water Consumption Figures". Toowoomba City Council. 10 March 2008. Archived from the original on 8 December 2007. Retrieved 12 March 2008. ^ "Pipeline sparks water price assurance". ABC Southern Queensland. Australian Broadcasting Corporation. 29 January 2010. Archived from the original on 11 November 2012. Retrieved 23 September 2010. ^ Australian Bureau of Statistics (31 October 2012). "Toowoomba (Urban Centres and Localities)". 2011 Census QuickStats. Retrieved 12 August 2015. ^ "Sister cities". Toowoomba Regional Council. 9 September 2008. Archived from the original on 19 February 2011. Retrieved 20 July 2010. This Wikipedia article incorporates text from Language Resources for Toowoomba and Darling Downs published by the State Library of Queensland under CC-BY licence, accessed on 16 August 2018. Knowles, J. (1959) Toowoomba as a Railway Centre, Australian Railway Historical Society Bulletin, January 1959 pp. 10–16. Wikimedia Commons has media related to Toowoomba, Queensland.